Italians love artichokes. 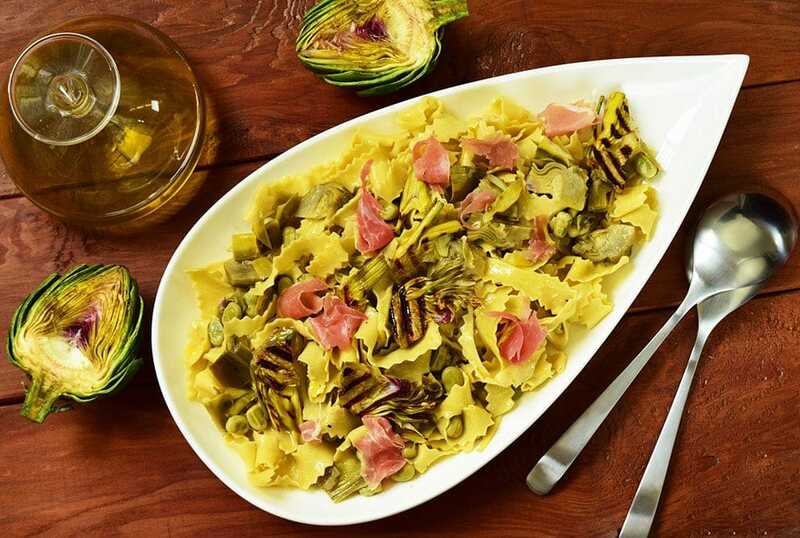 Throughout Italy, there are so many dishes with artichokes and they vary by region. You can find the famous Roman artichokes deliciously prepared in the Jewish Ghetto in Rome and you can find beautiful violet ones in Sicily. Just like in Italy’s famous outdoor markets, you can find them fresh in the farmer’s markets here in America. I was at the Hollywood Farmer’s Market and saw a stand with the most beautiful violet artichokes that reminded me of Nonna’s stories about a feast in Ramacca, Sicily when she was a little girl. Her grandmother was from there, which is a small village in beautiful Catania, that produces the Violetto artichoke. It goes well with smoked cheeses, baked with Paccheri, and stuffed with meats and breadcrumbs. 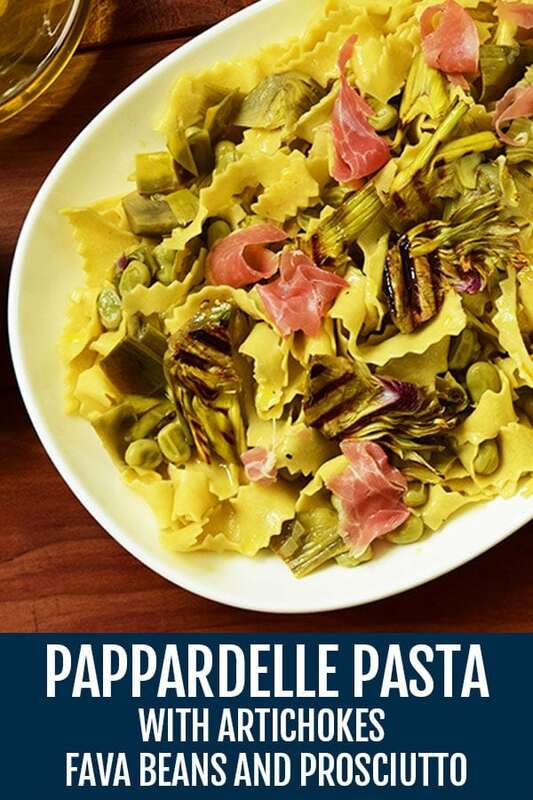 In my family for generations: “Pappadelle with fresh Artichokes, Fava beans, and Prosciutto.” My Nonna would make it for me when I was a little boy, and I have such fond memories of her in the kitchen preparing the violet artichokes and shucking the fresh fava beans from their pods, then making the fresh pasta by hand and serving this delicious dish to us. With my lucky purchase fresh from the farm, I made this incredibly flavorful and healthy dish. Don’t be afraid of cleaning fresh artichokes, it’s much easier than you think. Just take your time and use a sharp, serrated knife and you will see the violet color pop from the inside. If you haven’t made fresh pasta before, this is a perfect time to start. Pappardelle is one of the easiest to make, and it makes the difference in taste and texture, and it only takes a few minutes to master. This dish will definitely impress your friends and family, when you say you made the pasta from scratch, and because it is so flavorful and delicious. 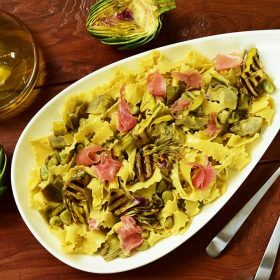 An easy to make pasta recipe with artichokes, fava beans and prosciutto that will make your guests happy! Fill a large bowl with cold water and juice the lemon into it. Set aside. Clean the artichoke by pulling the outside leaves until you get to the very tender ones. Cut the tips with a serrated knife, about 1-inch from the top. With the help of a sharp knife trim the bottom part around the heart. Cut the artichokes into quarters and transfer immediately to the lemon water. Slice one of the artichokes lengthwise to 1/4-inch and grill it. Set aside. In a large skillet sauté the shallots on medium-high until tender and translucent. Add the smashed garlic cloves and stir for an additional minute. Transfer the artichokes to the skillet add the fava beans and salt and pepper. Stir to combine, add the vegetable stock and bring it to a simmer. Cover and lower the heat to medium-low. Cook for 15 to 20 minutes or until the artichokes and fava beans are tender and cooked through. Add the fresh Pappardelle and cook, stirring occasionally, for 3 minutes. Drain, reserving 1/2 cup pasta water. Transfer the pasta to the artichoke sauce and toss. Stir in some of the reserved pasta water if sauce looks dry. Add the prosciutto and transfer to a warm serving plate. Top with Parmigiano-Reggiano.